The Internet is capable of both organizing your life and sending you down a rabbit hole of non-productivity, a distinction that typically just comes down to whether your job is researching fainting goats that hilariously scream like men. 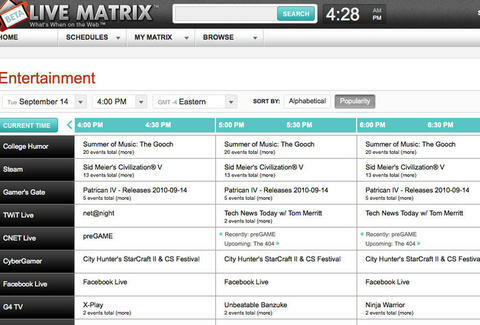 At least organizing the internet to help you waste time more effectively: LiveMatrix. Co-founded by a former SVP of TV Guide, LM's recreating the magic of his former employer on the 'net, indexing upcoming real-time content from vid webcasts, to live chats, to sales, to "anything that has a start time and can be attended online", assuming your presence is requested at the marriage of Mr Bojangles and his Cheezburger. Boasting a slick interface a la the DirectTV guide, the site's proprietary algorithm scours the web for scheduled events then divides them up into genres (sports, news, entertainment, shopping...) and channels; each listing gets its own event page with further deets, a live stream if avail, and a direct link to the source, in case you want to be insulted by Suge Knight and then crushed in a brawl. You can also filter upcoming content by the day/hour, and save anything worthwhile to an event queue, which'll email you a reminder 15 mins before it kicks off, and can be exported to your Google/Outlook cal, because people hell-bent on distracting themselves with the internet typically keep meticulous e-calendars. In case you suffer from indecision, LM's proud to identify the most popular events up front, though if your job is watching a rabbit hump a shoe, don't worry, you're way ahead of the curve!